How I use my notebooks is something I think about a lot. In July 2015 I wrote a post on my notebook set-up exploring what notebooks I used and more importantly how I used them. However since July quite a bit has changed therefore I wanted to post a February 2016 update running through my notebook usage. A daily carry notebook is really important for me. Without this I would feel lost and not have somewhere to scribble down random thoughts that pop into my head. For the past couple of months I had been using the passport Midori Travelers Notebook as my catch all system, however last week I moved into a Raydori and two Field Notes memo books. I may switch between these two notebook systems, but a portable, pocket or passport sized notebook will always be an essential carry around. One of the Field Notes contains the mundane and boring things that I need to remember on a daily basis such as shopping lists, things I need to do, doodles, tattoo ideas and garden plans. I complete one of these notebooks every month. I am using a second Field Notes to doodle. I am not very creatives but having a blank page notebook with me at all times gives me the opportunity to doodle or sketch out something I may see during my day. So far this has been going pretty well. Depending on the notebook I am using I will have a pencil, a Pilot Hi-Tec-C or a fountain pen to make notes. My Travelers Notebooks are used for various things and I have wholeheartedly jumped into this system. I have two Travelers Notebooks on the go each with two notebooks inside. My brown Travelers Notebook houses a plain refill used to hash out anything to do with the blog and outlines of post ideas. My second refill is the monthly planner where I have a full picture of what my month looks like. In this calendar I note down blog related content, when drafts are started, when photos are taken and when the final review is done. I also add in when I need to get some studying time in. I don't include anything from my personal life in here, I use this planner to see what work I need to do and how I can fit it all in. My blue Travelers Notebook is where I have a weekly calendar refill and a ruled notebook. The weekly planner is somewhere I can record the days events, no matter how mundane they are. I try and add in a small doodle to be a little bit creative. On the right hand side of the page I add anything I feel could be memorable to that week. Sometimes I just draw on this page, I mark down books I have read, or starting reading or may stick in a ticket from something I have done that week. I love using the Travelers Notebook and the refills. The size of the notebook means that you can get that little bit more onto the page without the notebook becoming too big and bulky. You also get to enjoy a wide variety of different pens on this paper without any fear of fountain pens feathering or bleeding through on the page. I am still using and enjoying the Hobonichi Techo. I use this to record a more in-depth and personal account of my day. This year I was leaving space on the page each day to include a photo as a visual momento of my day, however after filling up January I am not sure the Techo would make it through the year. I have therefore abandoned that idea, but may include the odd photo here or there over the course of the year. I am not very creative with the Techo and I don't try and get crafty with this at all, I purely using this as another outlet for writing. This doesn't get used that often, and when it does it's usually because I have a lot of things in my head that I need to get out and I've run out of room elsewhere. This notebook isn't pretty. There are no doodles, sketches, or pretty handwriting. This notebook is scruffy and has pages and pages of scribbles. I include in here the date and time of an entry and one long stream of consciousness. This is my review notebook. It has great paper especially for fountain pens and I have been steadily working through one of these notebooks since I started The Finer Point. I really like the Ice edition as the grid colour is grey and blends nicely into the background making the words and beautiful ink colours stand out. I would happily use these notebooks for other tasks if I had a need as they are so lovely to use. I have often neglected the work notebook, but for my day job I need to take notes. I am currently trying out the Word Notebook for this due to its list making layout. I have been using this mostly with pencils as the paper in these notebooks does not like fountain pens. The more toothy paper works well with pencils and means I have a dedicated place to work with graphite, which sometimes takes a back seat when there are so many pretty pens lying around. I use my Field Notes to take notes on my course work. This year I am doing an introduction to design course and I didn't want to lug around or buy more notebooks when I have a healthy stock of Field Notes. Since I started in October I have gone through 4 of these notebooks and I almost completed the 5th now. They are perfect for writing down small notes that I need and for doodling out ideas and designs. I am obviously not a one notebook sort of person but I feel that each of these notebooks has a purpose. I use several notebooks to record my day which may seem excessive, however they each fill a different role and allow me to enjoy a slightly different system. I am sure as time goes on these may reduce down as I find something that works just right for me. By having so many notebooks on the go at one time it does mean that I get to enjoy using my pens and pencils. At the end of each day I spent anywhere between 15-30 mins reflecting and recording my day. After using my Travelers Notebook weekly refill since December 2015 I have flicked back through my completed weeks and it's really nice remembering what I have done. I don't do this as much with the Hobonichi Techo as it's long blocks of writing so perhaps in the long term how this notebook is used will change. Some of my other notebooks are functional and needed just to do the normal day to day things and I need a dedicated place for these notes. I'd love to hear how many notebooks you use at one time. 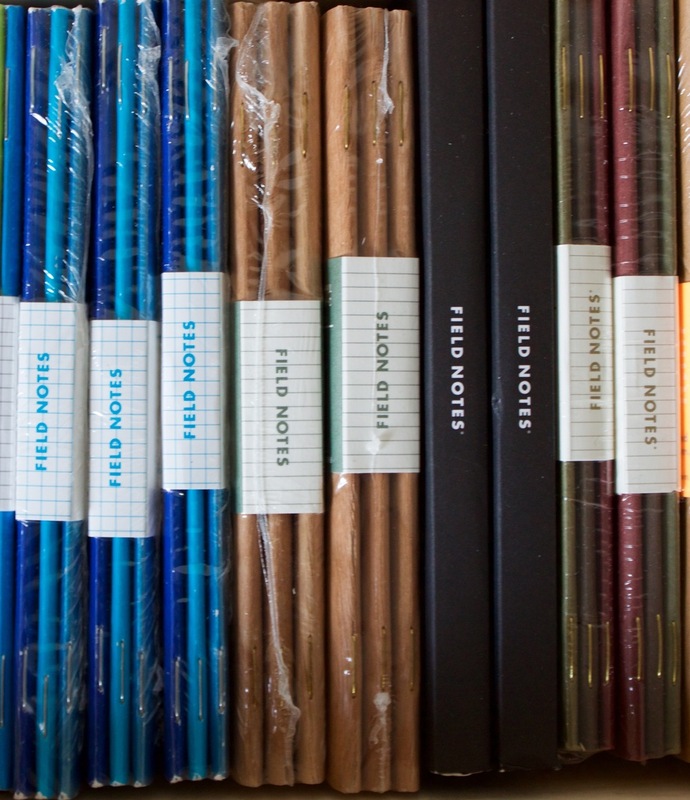 Do you use as many as me, or are you the one notebook at a time person? I haven't done a loadout post since December 2015. As before I have broken my loadout into groups to make some sense of the choas. I really enjoy using a variety of different products and sometimes you need to find the right stationery pairings. Regular Midori Travelers Notebook - I now have two of these beautiful notebooks. My Blue Travelers Notebook holds my weekly refill where I try and be a little bit creative recording my days and practicing lettering. I also have a ruled refill in this notebook. I recently added the orange elastic that comes with the brown Travelers Notebook after Wonderpens recent post. I love the contrast of the orange against the blue. My second Travelers Notebook holds everything to do with The Finer Point. I have a monthly calendar where I keep on top of everything I need to do with my blog and also track my study schedule. My second refill is a blog brain dump refill. Midori MD A5 Ruled Notebook - this acts as my extended journal. When I need more space to write, this is the notebook I use. I love this notebook as it lies flat and it handles fountain pen ink really well. Hobonichi Techo - I continue to enjoy using this little book even after a year. I am still using this to record my days and this year I am including a little photo from my day. Pilot Hi-Tec-C - I use a selection of these gel pens in my Travelers Notebook. I have a combination of sizes including the 0.4mm and 0.5mm. I am using the black, brown, violet and cherry pink colours and at the moment two of these refills are loaded up in my Karas Kustoms Render K and the Ateleia Brass Pen. Sakura Pigma Micron 03 - I use this pen for doodling and lettering in my Travelers Notebook. I have been trying lots of different fine liner pens lately. I love the way they write and they are so durable. TWSBI 580 RB - I have this inked up with Pilot Iroshizuku Tsutsuji-Azaela. I love the vibrant pink colour of this ink and by using this in a demonstrator pen I get to enjoy the colour even when not writing. Karask Kustoms Ink - I have this fountain pen inked up with the Pilot Iroshizuku Fuyu-gaki. This bright orange adds a nice pop of colour to my notes. The Ink has a fine line which is actually fairly bold and means I get to enjoy a nice thick line of orange on the page. Lamy AL Star Copper Orange - I have this inked up with the Lamy Black T-10 ink cartridge. I quite like having a plain black ink in one fountain pen. Lamy Safari - This is inked up with the Pilot Iroshizuku Ku-Jaku an ink I have found myself enjoying again and again. Pilot Kakuno - This is inked up with the Pilot Iroshizuku Ama-Iro. This is a new ink I received for Christmas and I love the light blue colour. Pilot Metropolitan - I have this fountain pen inked up with Pilot Iroshizuku Shin-Kai. I love the super fine line on the Pilot Metropolitan and with Shin-Kai it makes a great writing partnership. I think this is my favourite low cost fountain pen that looks and feels great to write with. Passport sized Travelers Notebook - This holds my personal monthly view calendar and a ruled notebook. This is the notebook that I carry with me on a daily basis and where I dump anything that pops into my head. Field Notes Kraft, ruled notebook - This is being used to take notes on my design course and while I have loads of different colours editions available I thought I would go back to basics and go with the original. Pilot Coleto - I have an aqua blue, green, orange and cherry pink refill in this pen. This is a great pen for school work as I can have 4 different colours to hand, in one pen making note taking a breeze. Staedtler Tradition H - I use this for any doodles or outlines I need to make as part of my course. Staedtler pencils write really well and they look great. Word Blue Mountain notebook - I loved the design and the colour of these notebooks. This is the first Word Notebook I have tried and I have been using this for my work to do lists. Blackwing pencils - I use these a lot for taking notes at work. Pencils work so well in the Word notebooks which gives me a perfect excuse to increase my pencil use. I have added an orange eraser into my 602 for something a little bit different. Caran d'Ache Edelweiss F - a simple pencil but one that I really enjoy using. This pencil matches my Blue Mountain notebook quite well too. Tombow Mono 100 - This was one of the first pencils I bought. The Mono 100 looks great and writes so smoothly. Staedtler Wopex - There is something strange about these pencils and the waxy barrel can be a little bit odd, but for some reason I quite like it. Every time I prep for one of these posts I am always a little bit surprised by how much stationery I use on a daily basis! My loadout shows that I like using Japanese stationery and Midori has become my go to paper product over the past few months. I like the design of their stationery and the way the paper handles an array of different pens. As always I'd love to hear about what you're using and what are your favourite must have items.